With the kids out of school and everyone eager to hit the beach and theme park, summer can be one of the most expensive times to travel to popular family destinations. However, with a little advance research, it’s possible to plan a fun summer break that meets your budget and your family’s needs. To help you out, we’ve found deals and come up with savings strategies for five top summer destinations for families. Our picks include three island destinations—two in the Caribbean and one U.S. island chain—and two U.S. theme-park hot spots. For Caribbean summer vacations, it’s hard to beat Aruba’s combination of off-peak pricing, family friendliness, and close-to-zero chance of being hit by a hurricane. While much of the Caribbean runs the risk of being struck by tropical storms during hurricane season between June and November, Aruba (along with Curacao and Bonaire) are situated outside the path of most storms. And, the island still receives fewer visitors during the summer and fall than during the more popular winter and spring break months, so prices for resorts can be substantially lower. For instance, at the popular Hyatt Regency Aruba Resort and Casino, we found rates starting at $225 per night in July compared to $630 for the same category room in February. Besides lower rates, families visiting during the summer can take advantage of Aruba.com’s One Cool Family summer promotion which entitles kids to free meals, free activities, and a free gift at participating resorts. Exact offerings and restrictions vary by resort. Another good deal is offered by the Divi Aruba All Inclusive. Between June 1 and August 31, the resort lets kids ages two to 18 staying in the same room as two adults stay, eat, and play for free—the rest of the year there’s a $50 per child per night charge. To learn more about Aruba resorts and summer discount opportunities, go to Aruba.com. For summer flights to Aruba from Miami, we found airfares starting at $280 before taxes on American Airlines. Use SmarterTravel’s price-comparison tool to compare Aruba fares from your home airport. Between the theme park tickets, the resort stay, and the meals, Disney World vacations are never cheap. However, you can save on trips late this summer with five-night promotional packages that include free dining at Disney restaurants. When you book a “Magic Your Way” package with five or more nights at a Disney resort between August 13 and September 30 plus theme park tickets, you’ll get to eat for free at more than 100 Disney restaurants. This plan entitles each person to one table service meal (appetizer, entree, dessert, beverage, and tip), one counter service meal (entree, dessert, and beverage), and one snack per day. To see how much this deal could help a family of four save, we compared rates for five-night packages including stays at Disney’s Coronado Springs Resort, six-day theme park passes, and the dining plan. For stays before the free dining is offered, the total cost was $2,138. For packages with the free dining included, the price was $1,559, a savings of $190 per adult and $99 per child. Read more about this deal on the Disney website. Learn about getting more for your money at Disney World by reading SmarterTravel.com’s Orlando Travel Guide. Although Hawaii was named one of the top 10 “best value” destinations for 2006 by the American Society of Travel Agents, prices for accommodations are still expensive, especially during the summer high season. However, if you still want to have a family vacation on the islands during this most popular time to visit, you can save if you know where the deals are. ResortQuest Hawaii, a collection of 27 resorts on Oahu, Maui, and the Big Island, has a Kids, Stay, Play, & Eat Free program that can help you cut down on costs on the ground. Kids 17 and under stay free, and kids 12 and under receive a special ID that entitles them to free meals and attraction admissions at participating vendors. The chain also has discounted Internet-only rates, even during the summer months, starting at $80 per night. Other providers also have summer Hawaii deals. Pleasant Holidays has six-day airfare-and-hotel packages from Los Angeles starting at $525 per person before taxes for travel June 14 through August 10. Through June, Aloha Airlines has sale fares from Oakland and other West Coast cities from $149 one-way, plus taxes. Researching the lowest fare for July and August travel from Los Angeles, we found Honolulu flights from $372 round-trip on Northwest and Maui and Kauai flights from $534 round-trip on Hawaiian. Taxes and fees are extra. Atlantis, a massive Disney-like resort complex on Paradise Island in the Bahamas, has something for everyone, including lower summer rates for those who want to experience all it has to offer without paying full winter or spring prices. Between May 29 and September 4, rates range from $305 to $1,901 per night, as opposed to $395 to $2,575 during spring break time. Rates drop even lower later in September, but the risk of encountering a hurricane goes up as well. June through August, there is a lesser possibility of encountering a storm, so it may be worth it to visit during this time. The 2,300-room resort features 35 restaurants and bars, the biggest casino in the Caribbean, and a 34-acre waterscape where sharks, turtles, and more than 50,000 other sea animals reside in 11 exhibit lagoons. There’s also the Discovery Kids Adventure program for children ages six to 12, a club for guests up to age 17, and elaborate water rides. We found summer airfare from Miami starting at $129 round-trip plus taxes on Bahamasair. Learn more about the Bahamas by visiting www.bahamas.com. With world-class attractions like the San Diego Zoo and SeaWorld plus miles of beautiful beaches, San Diego is a top choice for summer family vacations. Its popularity during school vacation months makes it pricier to visit during the summer, while many of the must-see family sights are always expensive. However, you can cut costs with careful advance planning. First decide what you want to see. If you’re only interested in one or two attractions, you can save at certain individual sights with coupons and online discounts. The California Fun Spots website offers downloadable coupons for San Diego attractions including $8 off the San Diego Zoo Best Value ticket ($32 for adults, $20 for kids), $8 off the Wild Animal Park Nairobi ticket ($29 for adults, $18 for kids), $8 off Legoland admission ($53 for adults, $43 for kids), and $7 off SeaWorld admission ($53 for adults, $43 for kids). If you want to see several top attractions, you may be able to buy a pass that gives you discounts on multiple sites. 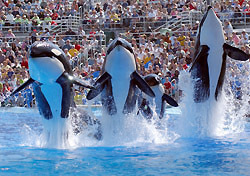 For example, the San Diego 3-For-1 pass costs $100 per adult and $77 per child, which allows five days of unlimited entry into the San Diego Zoo, Wild Animal Park, and SeaWorld. For $199 per adult and $159 per child, you can get the Southern California CityPass, which includes admission into the zoo or Wild Animal Park, SeaWorld, Knotts Berry Farm, and three days in Disneyland. Before buying a pass, make sure you plan to visit all the attractions included or you may not end up saving off the total cost of individual admissions. To read more about how to save on San Diego attractions, accommodations, and transportation, visit SmarterTravel.com’s new San Diego Travel Guide.